What is the battle plan for fighting psychiatric abuse ? Home › Forums › Organizing for Social Change › What is the battle plan for fighting psychiatric abuse ? This topic contains 16 replies, has 4 voices, and was last updated by ds_ghoste 2 months, 2 weeks ago. I just do the information war and help out ruing psychiatry’s credibility buy posting lots of links to the truth anyplace online likely to get views and wake people up. Their credibility is based on lies “chemical imbalance” ect. They have billions for marketing and lobbyists but we got the truth on our side, their greatest weakness. Weaken their credibility and you weaken their power. What other tactics does anyone suggest ? Fantastic idea man! I tried doing something similar last night, but the thread wouldn’t take. I’ve started mobilizing up in Canada by amassing research first (everything academic that exposes the “chemical imbalance” theory as a hoax, and anything related thereto). I feel that we need to be careful, however, about vetting researchers because we don’t want to backslide or to have our credibility challenged. Where we know there is a weakness with someone’s approach we need to expose that weakness ourselves, dismiss it, and illustrate that despite whatever their hokie approach to remediation might be, we have all been poisoned for the last 40-60 years (coinciding with the lobotomy unfortunately for some). And further, so long as a physician is inline with the Hippocratic oath it doesn’t matter what their approach is, it’s when their approach is actually hurting patients, destroying their lives, and their families lives that we have a problem, and that we take issue. That said, I’ve turned myself into a one man PR firm against psychiatry- if any of you want to adopt the same approach, wherever you might be in the World, then, please feel free. I’ve been contacting every form of media that I can think of or any form that crosses my path (radio, t.v., blog, social media, magazines, newspapers, etc.). Phone calls, emails, unsolicited visits, appointments, you name… use it! Please stick to the science always, we cannot afford to be discredited. If any of you have Faith, and know the Truth, then, reach out to me privately… (there is a phase 2 to my plan). I am going to add a list of my sources as a future post, but immediately below is info that we all need to be privy of, and that we should collectively step out on. -Schildkraut’s tautology (he goes in circles so his end result can be prescription), and the monoamine theory (his research was fraudulent too- see Dr. Kelly Brogan). -Somehow getting our hands on the research of Dr. Peter Gotzsche (University of Copenhagen, The Cochrane Nordic Institute, MIA) and his assays. We should track down his books. -My complete list of sources thus far: Dr. Gotzsche, Dr. Breggin, Dr. Hickey, Dr. Kelly Brogan, Eric C. Schneider, Dr. Jeffrey Lieberman, Robert Whitaker. All of these men and women know that psychiatric drugs are bad for us, and they in whatever capacity have already stepped out to confront the issue. Keep digging everyone, and let’s mobilize- we could get super organized and go State by State, Province by Province, Nation by Nation. Please keep to the science which exposes psychiatry as a sham, and their drugs as dangerous, debilitating. To anyone who is interested… write to me at [email protected], and I will get you my PR package with a synopsis of data, and all of my sources & links to date. I think we will need a major lawsuit of some sort before there is major change. Unfortunately, information alone has proven insufficient. I think gathering and dissemination fact is VERY important, because it changes the public discourse and makes it possible for people to come forward with their own stories and ideas. But the psychiatric industry is driven by profit, not facts, and until the consequences become worse than the profits, they’ll continue to use their power to spread the lies around, and they’re good at it. Well, we’ll just have to try a tiered erosion technique… undermining both the top and the bottom at the same time (grass-roots: social media, word of mouth, etc., coupled with attempts at meaningful discourse with the entrenched communication mechanisms of the State). The goal should be engendering support from as many as possible . . . Survivor stories prove the ultimate point to the disingenuous/criminal nature of the Mental Health Authoritarian Establishment. There are some very basic concepts to move people to, at the least, want to get more informed. 2. Personalize the Message – sometimes, many are not aware they are dealing with issues pertaining to “mental health,” but everyone deals with them through Tax Dollars. 3. Give the audience a path for more information – this is the tricky point . . . you need to support your stipulations with identifiable facts. Unaware Audiences get turned off with too much information. Offer them information from a very Broad perspective and further narrow down to clearly supportive specific examples. Review your 5 paragraph essay writing skills . . .
4. Stupid questions are still questions – do not discount those that have been misled and/or ignorant . . . If you cannot say something nice, say something constructive. 6. Give those uninformed real-world answers – the Trauma Model presented by Charcot Janet was discounted primarily due to his usage/method of hypnotherapy. The Trauma model was on the right track. People in Crisis need help and Real Help should be there when needed. Now . . . words have power and using them incorrectly can be destructive, but also informative. Rahm Emanuel was famous in the 1990’s for saying, “Never let a good Crisis go to Waste.” That is why it is important that defining a Mental Health Crisis, they acknowledged another chance to institutionally marginalize a whole segment of population . . . every crisis in American history has resulted in the further erosion of our Liberties and marginalization of people. Generally speaking, those receiving a DSM diagnosis have effectively been denied the acknowledgement of their subjective experiences . . . Generically speaking, Trauma. Once hospitalized (for lack of a better word) for a mental health issue, the DSM biomedical model’s circularity begins . . . priming the Marginalized to become Commoditized. I hope this assists in your efforts! I am still stuck on the same idea. Consider this action like the storming of the beaches at Normandy. D-Day. An out information-credibility assault on UHS. Universal Health Services, Americas largest provider of psychiatric abuse operating in humane psychiatric lockups across America and beyond I believe. Step 2. Fill in Company with the name of a UHS hellole facility I posted below. Pick at random doesn’t matter if we hit some multiple times. Step 3. Title of your review, I suggest something like another UHS hellhole posing as help. Be creative. Step 5. Add photo add video, if you are feeling creative sure otherwise just skip. And that’s it. I chose pissed consumer because after the original complaint is posted people find it in search results and can post their own complaints anonymously without any registration process that slows them down or is too much of a pain. I have done this before the complaints start piling up fast and driving away costumers and attracting the attention of regulatory agencies. They do read reviews. Try and select randomly from below, don’t everyone start at the top. Don’t do too many in one day as the website might catch on. Hospital owners, staff , doctors. If you were mistreated “cyber slander” is for you lol. Online defamation of character. Its really not slander or defamation if you are telling the truth just be sure to tell the truth as maliciously as possible ! OK, I hope I got the troops fired up !! Frankly it’s shocking that so many have been working on this for so long, and bureaucratic stonewalling seems to be the only response. I’ve made contacts at major Canadian news outlets, and one of my contacts told me that a story broke in the U.S. pertaining to all of this about a decade ago. However, due to the lobbying & special interest power within Washington the story was swept under the rug within a day of breaking. I’m pressing up here, and I’m reaching out internationally with my language skills (I can cover French & Spanish speaking nations as well). An approach I have adopted is to discredit them at the base (write to students, to law students, to faculties of law, faculties of psychology, sociology, etc. ), as well as to press for media attention (mainstream and otherwise). Thanks for your message man, and thanks for all of your hard work (as well as that of everyone else on here over the years). An addendum: I forgot that I sent a brief reply already (I tried to respond by email initially), my apologies for the redundancy. This reply was modified 3 months, 1 week ago by InSight. Brilliant my friend! Every author/writer needs an editor. I couldn’t agree more with your points, they’re fantastic! I have a tendency to go into great detail, but there’s a lot of info to be presented. Obviously, we’re not footnoting/end-noting for the general population. That said, you’ve reminded me to tap into the artist/musician in me as well to work within the conventions of great literature (parable, paradox, oxymoron, simile, metaphor, hyperbole, entendre, imagery, showing not telling, and using subtext more than text itself, etc.). Getting creative has immense advantages. As stated above, I have a PR package that I have already created- and have been shopping it around with some degree of success, and with hope on the horizon (media outlets saying that they like the content for an investigative/exposée piece). The question then becomes with respect to society and mechanisms of the State: how deep, and how extensive is the corruption? Who has been bought/paid? Does it involve full media co-operation? If so, how much collusion, corruption, coercion- is there? Or are they simply reporting what they think to be true, working on an anecdotal level, and therefore never exposing the truth? Never digging deep enough. Further, I’ve heard/read that most investigative teams have been fully slashed, and true journalism is feeding the maggots. However, you wouldn’t think that Vice, or Young Turks, or alternative media sources would kowtow to this kind of stuff, would you? I skimmed a piece in the NYT, recently, that started off critically, and then ended up as a sales pitch for a new psychiatric drug! We need a resurrection of true journalism! “If you were mistreated “cyber slander” is for you lol. Online defamation of character. Its really not slander or defamation if you are telling the truth just be sure to tell the truth as maliciously as possible !” I could not have written this any better! Let me ponder, consider, and pray about your destabilization campaign. I need to do more research on the target. At first glance… I’m intrigued. To garner support of general audiences, we have to display generalist narratives that can correspond to individual situations. We need to be able to draw historical parallels between the current state of Psychiatric “treatment” and other more commonly accessed systems. For example, the Conventional Medicine Model and Complimentary/Alternative therapies. There is a long history there and it’s easily shown to be a “for profit” system, not necessarily capitalistic. Conventional medicine has its place in acute care, such as an appendicitis or a broken leg. Chronic care is where Conventional Medicine makes its money. They would rather “Treat” than “Cure.” —-REMEMBER HISTORY MATTERS! At some point, the DSM model of mental health intervention will need to be exposed/attacked. There is plenty going on now. I am only now seeing how the model works and is culturally/politically/economically reinforced to the individuals’ detriment (IN GENERAL). I have a good generalistic narrative in mind, but I wish not putting it online, yet. The traditional media has long since lost its competence/credibility. No longer are there real watchdogs, with a few exceptions. Talk radio and Fox News exists to fill a market niche. . . if media had been doing its job, there would be no niche to fill. The Fairness Doctrine, and the aftermath, destroyed accessibility to reliable media/issue coverage. I have a personal experience to share about the Fairness Doctrine and how it was used to marginalize a group. In the early 90’s the woman I was dating, her father, was an executive at a local TV station. He recounted his experience with Ohio’s Right To Life wanting to purchase air-time. He let ORTL know, that according to the Fairness Doctrine’s implementation at the station, he would have to grant the opposition free air-time in order to be in compliance. ORTL did not purchase air-time. Three days after, Planned Parenthood ran commercials. . . and no equal time was offered. They were/are federally funded and that was a loophole. There is no real answer to getting Media attention, conventional media or otherwise. There are gatekeepers/editors that determine what is fit to print/air. Actually, I have a retired newspaper editor down the street from me. Maybe I will give him a call for guidance? There is NO DOUBT that the current MENTAL HEALTH system allows for, even supports, Psychiatric Abuse. There are too many similarities in stories from across the Western (DSM) World. Our role, besides bringing about CHANGE begins with ACCURATE REPORTING of how this came to pass. We also need to provide REAL SOLUTIONS. At some point, this conversation will need to go OFFLINE. Until then, I will continue offering guidance/experience if I find it might be beneficial to the CAUSE. 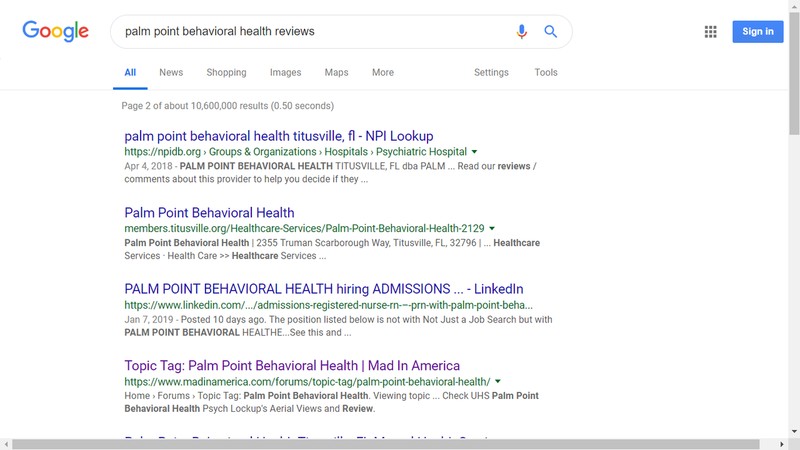 I just though of how to honestly write a bad review for any UHS hospital on pissed consumer, Google Yelp ect. This hospital is owned by UHS a company with a long history patient abuse, insurance fraud and is under criminal investigation by the U.S. Department of Justice. This > If you are mistreated like I was, and you will be, lawyers will not take your case because they know UHS has a massive legal department. They can do what ever they want to you. The most common thing I heard other victims of the UHS ‘hospital’ I was in was say “I am going to sue this place” I heard that constantly in the hallways. They believed that this would make staff think twice about mistreating them but staff heard that 1000 times and knows it rarely happens and when it does that the legal department of that multi billion dollar operation has their backs. I still have to work on the wording of it. THIS IS HOW I DO ACTIVISM , I GET RIGHT IN THEIR FACE. Only page 2 so far it might move to page one. Still a good example. I have scored lots of page ones doing this on many different websites. We do have some historical/philosophical guidance in our pursuit. Someone I had never heard about until I saw one of his quotes while listening to music, Eric Hoffer. What got me started was the quote, “The search for happiness is the chief source of unhappiness.” After reading the Amazon reviews of “True Believer: Thoughts on the Nature of Mass Movements,” I purchased the book . . .and shared. This is quite and old book, but still significant. Understanding the older references does require something of 20th Century History knowledge, but just about everything is still pertinent. I purchased it because I could not find it in any library in my state. I read it, shared it, and will read it again, once I get it back. True Believers, those that believe in the Truth and Righteousness of the Cause, are those that originate societal forces to Move towards goals. Although in his historical context, many of the Mass Movements were towards consolidation of power in fewer and fewer accountable entities, enabling atrocities. Exactly the situation we are dealing with. . . the unaccountable, often immunized, publicly accepted, mental health system we are forced to combat with today. I think/feel that we can tackle this from two locations at the same time, from on high, and below, word of mouth, as well as dissemination directed at the media, and academia. It’s interesting to note that for a very long time psychiatry was regarded as a pariah, and now through a very successful marketing campaign have fooled everyone into believing that they have credibility. The alterations in the DSM that I have read about or heard seminars of are disgusting (with racial, economic, and political agendas, not to mention the complete fabrication of the “chemical imbalance” theory). Dr. Christopher Lane writes on how DSM I and II changed for the worse in the face of the civil rights era in your nation (I wouldn’t take much of anything else written therein very seriously, as the writing oscillates all over the place). The concept of the modern psychiatrist is really no different than the leacher or blood letter (there’s actually a scriptural verse that explains any success, if at all- “when I am at my weakest, the Lord is at HIS strongest”)! How effective was the lobotomy again? How effective is this modern drug-based debacle? Hmmmmm. The forum ‘Organizing for Social Change’ is closed to new topics and replies.